A bush wedding is a joyous and heart-warming experience. The change in season has brought with it the first signs of new life. As the temperatures increase and the humidity slowly thickens the air many of the plants have reacted by producing fresh new leaves and bright aromatic flowers. One of the more obvious trees the Weeping boer-bean (Scotia brachypetala ) produces tufts of brilliant red flowers that create a fantastic contrast to the currently stark landscape. The flowers also emit an aroma that can be smelt for some distance. The local name for the tree is “Mvomvomvo” as the abovementioned attracts an array of insects creating a constant buzz overhead hence mvoooo-mvoooo. 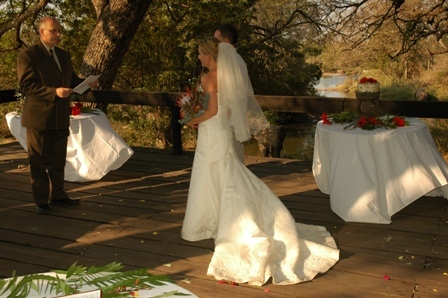 The season also brought a change for a special couple this month: Alana and Eric Lapierre tied the knot at Inyati on the 16th of September 2009. It was a relaxed and very romantic affair that in included a private vehicle and private meals allowing the couple to savour the moment. During the ceremony an Elephant bull joined the proceedings to witness and bless the wedding in true African style. 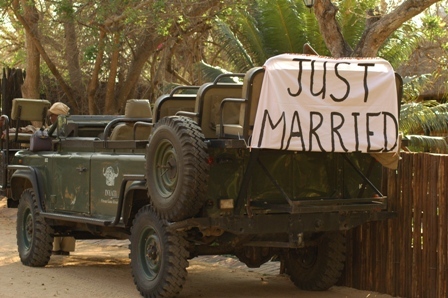 After the ceremony the newly weds set of into the bush, wedding dress and all, in a Land rover carefully decorated by Piet and Nelson with all the bush flowers they could get their hands on. The couple was met by a pride of lions and a herd of buffalo to top off the day. The Inyati family would like to wish Eric and Alana a prosperous future and hope for them to return to the bush one day, maybe with some little ones of their own!